Be their hero – because every child deserves to feel the magic this holiday season! 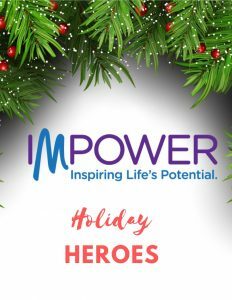 IMPOWER’s 6th annual Holiday Heroes Gift Drive has begun! Over the years, IMPOWER has provided toys or gifts for thousands of disadvantaged and at-risk children and youth served by our child well-being and mental health programs. This year, we invite YOU to get involved by sponsoring a child, donating a gift, hosting a drive, or making a financial contribution between now and December 10th. Request one or more wish list(s) for specific children or youth. We’ll provide you the list(s) and you do the shopping! Email rrobinson@impowerfl.org for a wish list. Donate a toy, gift, or gift card or shop from our “Most Popular Wish List” to help provide gifts for children and youth who do not have a sponsor. Collect new toys, gifts and/or gift cards at your office,civic club or place of business. Or, are you hosting a holiday party this year? Consider asking guests to bring a toy or gift to donate to a child in need. No time to shop? Your tax-deductible donation will help children in need have a memorable holiday. Donate online here to make your gift. Consider sharing your time and help us fill wishes. Includes sorting, organizing, wrapping, assembling and more! Multiple shifts available. Individuals and groups welcome! 111 W Magnolia Avenue, Longwood, FL 32750. (Additional evening and weekend hours will be posted as we get closer to the due date).